Our vacation is soon drawing to a close, but we’re not yet rejoining our northern kin in their snowy winter. 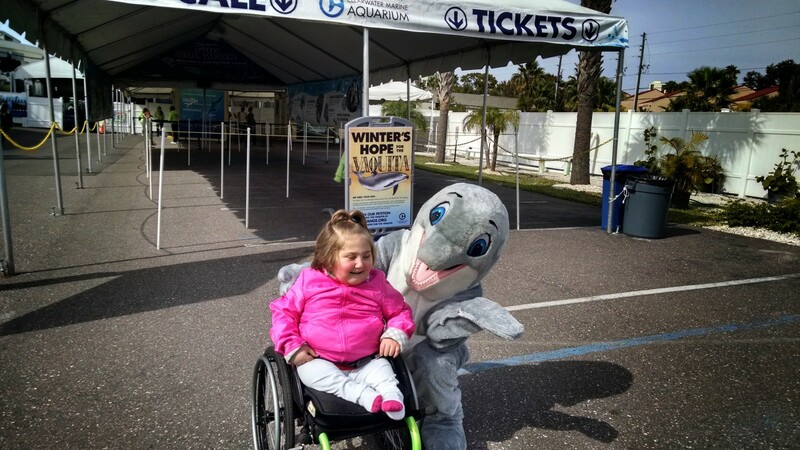 No, today we saw Winter the dolphin, star of the movie Dolphin Tale, at the Clearwater Aquarium. Outside the aquarium, where they sell tickets, there’s some poor guy (or gal) in a dolphin suit. One of the employees said hi to Namine in that annoying, falsetto voice that people use when talking to very small children or animals. I hate that. I know Namine is small for her age (and for good reason), and yeah, she’s in a wheelchair. My one wish — if I got one — is that people she meets would see her for her, not her stature or disability. But I digress. The greeting lady asked Namine if she wanted to have a picture with Winter, gesturing to the costumed person. But Namine, of course, wasn’t fooled. 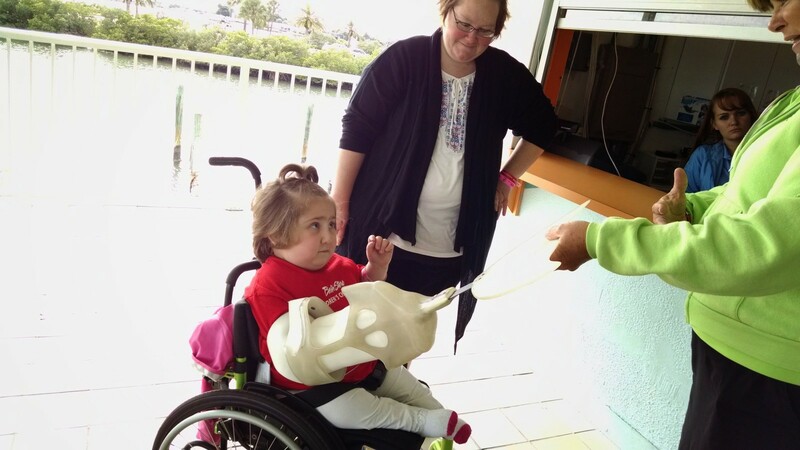 As she lined up her wheelchair next to the costumed dolphin person, she turned her head and said, “Hi! I like your dolphin costume!” It didn’t bother her — or she didn’t let it bother her — that she was talked to in a childish way. She’s usually pretty good about taking that kind of thing in stride. Even though the Clearwater Aquarium (which, to be precise, is a marine animal hospital) is best known lately for the dolphins Winter and Hope, there are all manner of sea life which call it home. The best view of the dolphin pools was upstairs (and thankfully they had an elevator), but we viewed the ground floor’s animals first. There was a small stingray petting pool, but unfortunately none came close enough to the surface for Namine’s arms. She was willing enough to stick her arms into the water and wiggle her fingers to get their attention, but to no avail. 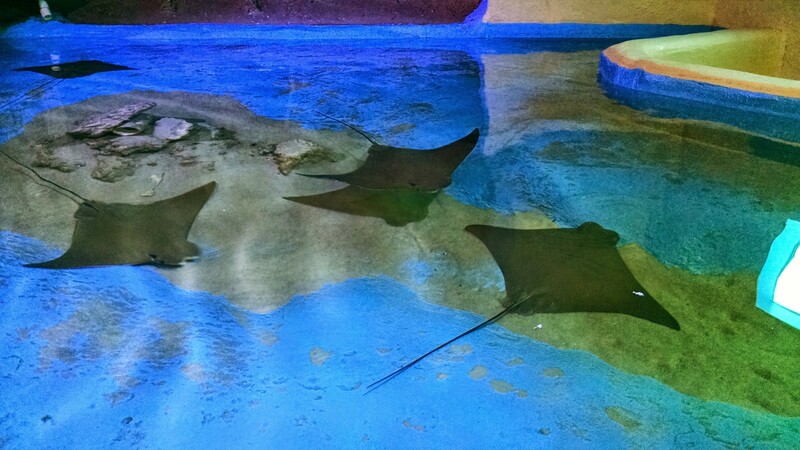 There was a large tank which housed nurse sharks and more rays. 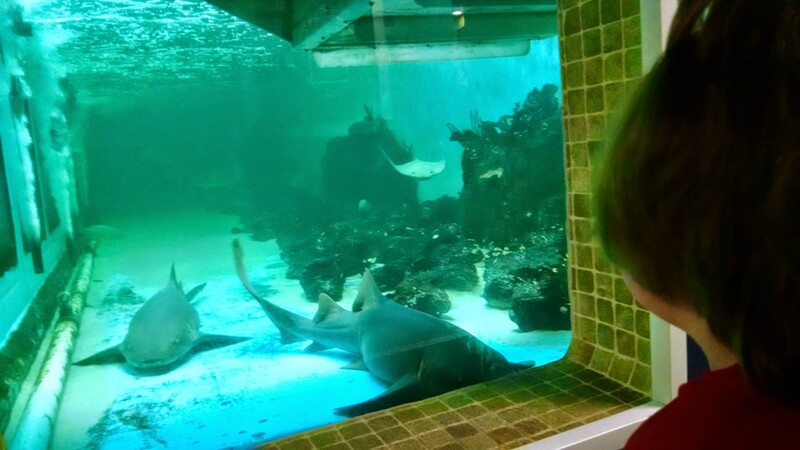 Namine always loves to see rays — we all do — but sharks, I think, will always hold a higher fascination. (I know they do for me.) She wanted to know why the sharks didn’t just eat the rays, which prompted a discussion about the difference between a bottom feeder (which nurse sharks are) and the more active hunters (like makos and great whites). 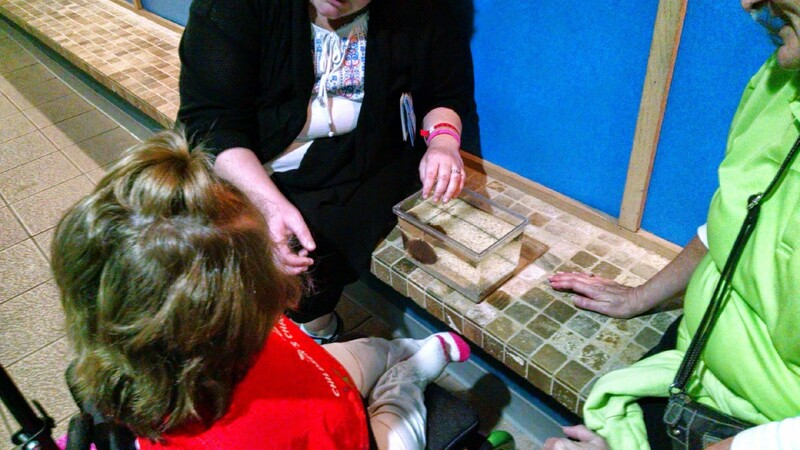 There was also the opportunity for Namine to touch a sea urchin. This particular kind of urchin was spiny, not unlike a prickly cactus. Namine wanted nothing to do with it, however. In the small pool of sea life on display, I looked for a ragged sea hare (one of which my brother and I found when we were younger, and with it tormented our younger sister), but none were found. After riding the elevator to the second floor, we visited the dolphin pools. There were three pools, interconnecting but also able to be segregated when needs arose. 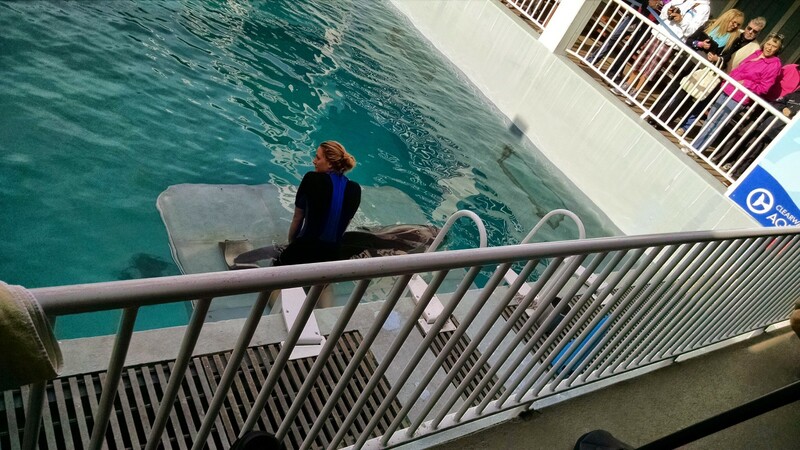 Thanks to the movie Dolphin Tale, we expected to see Winter with her prosthetic tail, but we did not. 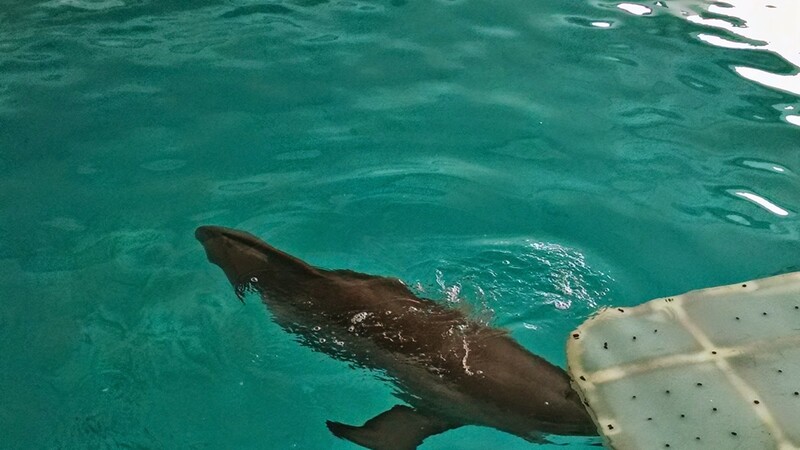 To our surprise, there she was swimming with other dolphins, no prosthetic to be seen. We learned that contrary to the movie’s depiction of Winter’s life depending on her having a tail and fluke, the reality was not so grim. Winter has therapy at a minimum of three times a day when she must wear her tail for her exercises, but the majority of the time she can swim freely without it. That part of the movie was true — Winter taught herself how to swim without a tail and fluke, and she gets around her pools very quickly. The parallels between Winter and Namine are striking to me. While Namine has her feet, she has had to learn to do certain things differently than her peers, thanks to her having caudal regression syndrome. The first which comes to mind is crawling; Namine’s hips and legs don’t work the same way most children’s do, and she had to figure out her own way of getting around. Similar to how Winter doesn’t wear her prosthetic all the time, but must for her physical therapy, Namine too must wear her AFOs — her braces — for therapy, but she needn’t wear them all the time. And before every therapy session, Winter’s spine must be stretched, much the same way Namine’s feet must be stretched before her therapist helps her put on the braces. Winter having her spine stretched before therapy. When Namine held one of the prosthetic tails that Winter has worn, it was plain that she too saw the parallels. Point of fact, Winter’s sock and prosthetic tail are made by Hanger Orthopedics, the very same company that makes Namine’s braces. We took a trolley across town to the Dolphin Tale Adventure, which is a museum containing props from the movie. 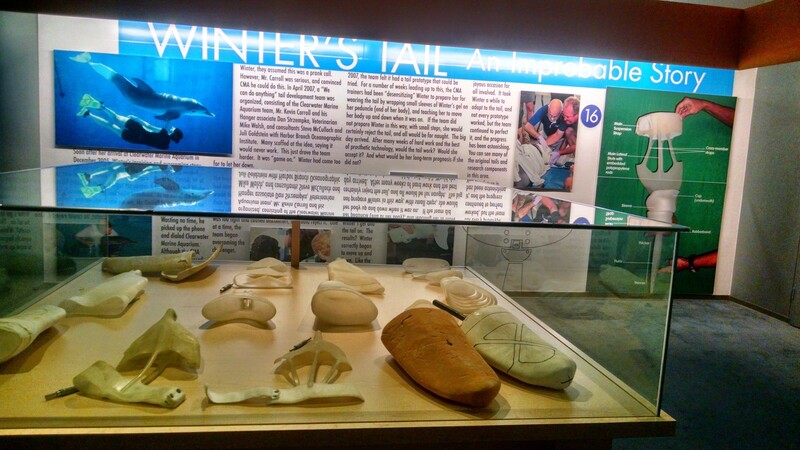 Also on display were many of Winter’s old tails. We were told that many of her tails are reused, or at least parts are, so it’s impossible to say exactly how many she’s had. After we left the museum, we all went to dinner — and there’s no place in Florida to sup like right on the beach. A Florida sunset is not something to miss. So glad you all got to see Winter!! I took my daughter to see Dolphin Tale and ended up sitting there crying through most of it because of the similarities between Winter and my son. We too use Hanger for Jonah’s braces. I hadn’t anticipated the parallel. Great post! So sweet how Namine made the connection with the braces!